Regular watering. Water new plants about twice a week until they are established, about a year. After that, your garden needs about 1 inch of water a week, and especially during periods of drought. Annual mulching. Mulch is an important component of your rain garden. It protects the plants, keeps the soil moist, reduces weed growth, and improves the infiltration of rainwater into the garden. Maintain a 2- to 3-inch layer of mulch—adding new mulch in fall or spring. Make sure mulch doesn’t collect in the basin, however, as this reduces ponding and the functioning of the garden. About every three years you may need to remove and replace old mulch. Removing accumulated sediment. 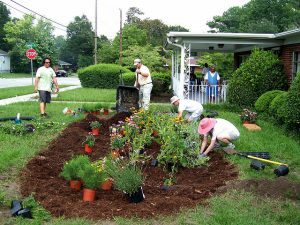 Rake back mulch and remove silt, debris, and eroded soil that washes into your rain garden—otherwise it can decrease infiltration and kill your plants. Clean away any sediment that has accumulated at the inflow point. Regularly remove fallen leaves, twigs, and dead vegetation. When mowing, avoid discharging grass clippings into the rain garden. Pruning and weeding. Follow good pruning and deadheading practices for all shrubs and perennials to maintain a neat, well-managed appearance. Weed new gardens frequently to keep weeds from competing with plant growth—avoid using herbicides. 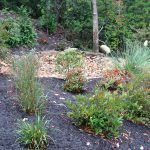 An established rain garden needs less frequent weeding. Skip fertilizing. Fertilizers are typically unnecessary. 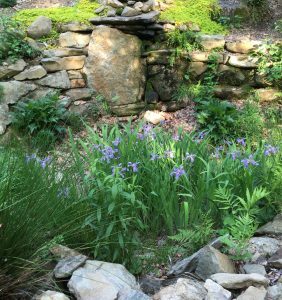 Your garden construction, soil amendment, mulch, and selection of native plants provide a solid foundation for a healthy rain garden. Replanting. Over time, you may need to replant areas of the garden as sun, shade, and moisture levels change. If a plant isn’t doing well in one area, don’t hesitate to move it to a different location where it might have a better chance of thriving. Divide perennials when they overgrow their allotted space. Stormwater is directed to this attractive rain garden. 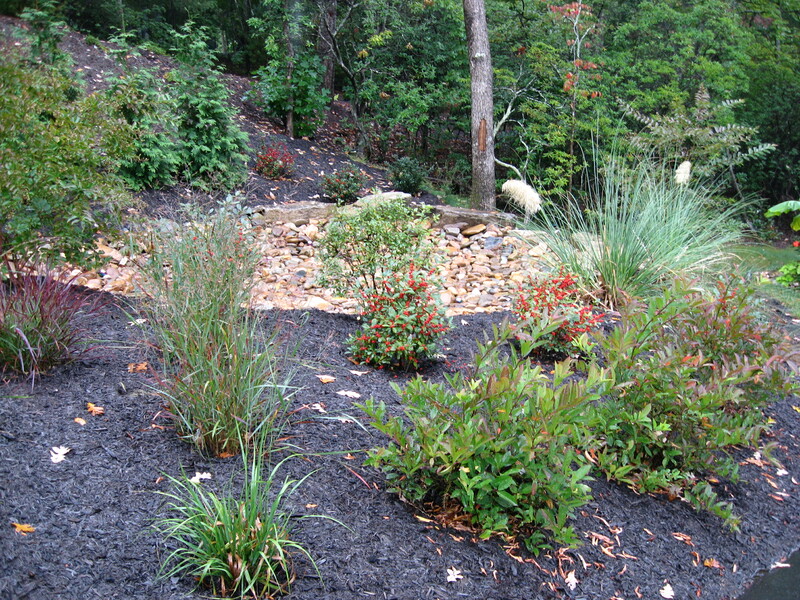 Integrated plantings anchor this rain garden berm. 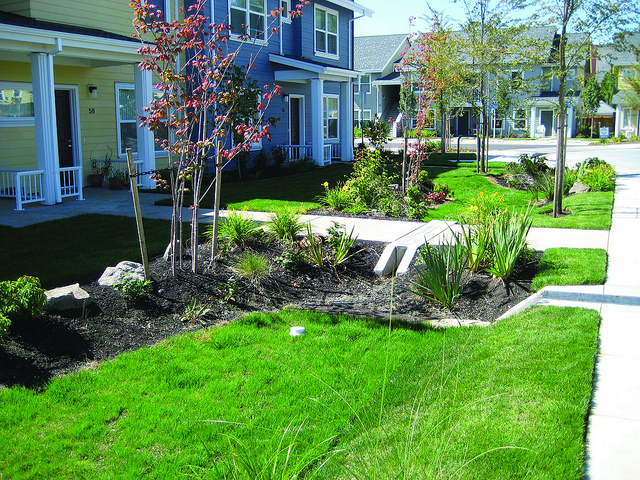 Rain garden adds beauty to this residential landscape. 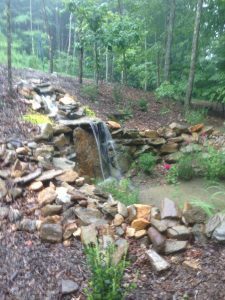 For addition information, see previous blogs in this series, Rain Gardens—Parts I, II, and III, for resources on building and planting. Rain Gardens—Part III: It’s Time to Plant! Now the fun begins! Bring your rain garden to life with a variety of interesting plants. Choose plants only after taking into account the many factors that contribute to the long-term success of your garden. Natives. Select plants native to your area to reduce maintenance—natives are already adapted to local climate, soil, and pests. 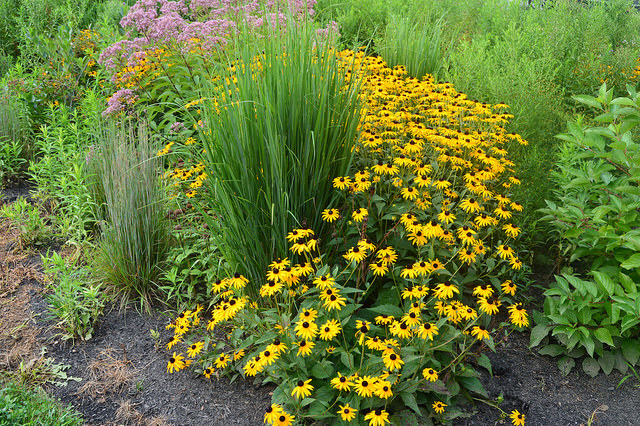 Black-eyed Susans (Rudbekia hirta) fill this rain garden with color. Sun vs. shade. Depending on your rain garden site, choose plants best-suited for full sun, part sun, or shade. With so many options among trees, shrubs, perennials, and grasses, you are bound to find the right plants for your space. Be aware that if you install trees or large shrubs, they will increase the amount of shade on your rain garden as they grow. Integrated planting. Mix plants of different heights, textures, colors, and bloom seasons. Variety is visually appealing, creates year-round interest, and reduces the chance of disease spread. Design your plant layout on paper first, using colored pencils to draw circles of various sizes to represent different plant groupings. If you purchase your plants, set the containers out in the garden according to your plan and assess their positioning and how they look together. Rework the arrangement until you achieve the visual effect you desire. Start with small plants. One to three-gallon sizes are easiest to plant and establish quickly. Look for plants with well-established, healthy root systems. You can also start seedlings indoors or get transplants from friends. Water tolerance. The most water-tolerant plants go in the center of the garden where they may need to survive one or two days of standing water. As you move toward the outer edges of the garden, you can use plants that are less susceptible to damage from wet soil. Place sturdy plants around the water inflow and outflow (weir)—or the points at which water velocity and volume will be greatest. Volunteers plant a rain garden at the Fannie Norwood Memorial Home in Wilmington, NC. Follow good planting practices. Dig the hole for each plant twice as wide—and only as deep—as the container. Mix the soil from the hole with compost, loosen and spread the plant roots, set the plant in the hole so that the crown is at or slightly above the surface of the ground, and backfill the hole with the original soil mix. Firmly tamp down the soil around the plant roots and water thoroughly. Finish the garden with 2 to 3 inches of hardwood mulch, keeping the mulch from piling up against plant stems. Do not let roots of new plantings dry out. Water twice a week until plants are established, which may take up to a year. The photo below of a rain garden at The North Carolina Arboretum in Asheville showcases many of the features we’ve discussed in our blogs. 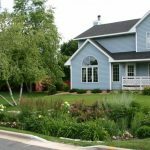 While larger in scale than a home garden, the design elements remain the same and provide a learning model for any homeowner thinking of building a rain garden. This rain garden is strategically located on a downward slope and sized to handle large volumes of rainwater runoff from the garden and street above. Note that the garden basin is carved out well below street level, or the source of the water runoff. After digging the basin, the contractors layered different materials to ensure water infiltration. First, a porous filter fabric, lining the bottom of the hole, separates sediments and prevents them from creeping down into the ground below. Next, a layer of perforated pipe covered with a layer of gravel promotes drainage from the center of the garden. The final layer is a soil mix that allows water to drain quickly and anchors the plants. The sodded slope at the street helps slow the water down and disperse it as it moves toward the basin. The stone retaining wall hides an underground pipe that empties water into the garden. There is a rock apron laid in front of the pipe to absorb the force of the water, help prevent soil erosion at the inflow point, and collect silt and debris. This rain garden absorbs water into the ground of at the rate of 1 inch of water per hour. On rare occasions, overflow is routed to another underground pipe hidden beneath the tall shrubs on the downhill side of the garden. Most of the plants are native to the area and provide a mix of foliage colors—chartreuse, burgundy, blue green, and deep green—as well as a variety of textures—feathery, stiff, upright, dense, and open. Plantings are grouped according to their water tolerance and are able to withstand dry conditions, as well as periodic submersion. Dwarf blazing star (Liatris microcephala) is closest to the inflow point and set off by a backdrop of miniature tall bearded Iris (Iris fulva), and switchgrass (Panicum virgatum ‘Prairie Sky’), as well as cardinal flower (Lobelia cardinalis), a showy, red-flowered perennial. Planted in the lowest part of the basin, where most water accumulates, are common rush (Juncus effuses) and swamp hibiscus (Hibiscus moscheutos). Moving outward into the middle zone are a variety of shrubs—arrowwood viburnum (Viburnum dentatum), Virginia sweetspire (Itea virginica ‘Little Henry’), and fothergilla (Fothergilla x intermedia ‘Mount Airy’). The tallest plants anchor the top of the berm on the downhill side of the garden—common winterberry holly (Ilex verticillata), a lavender twist redbud, and three deodara cedars (Cedrum deodara ‘Shalimar’). The hollies and trees provide height, structure, and winter interest, but will never get large enough to shade this sun-loving garden. The berm is finished off with a low-growing, creeping juniper (Juniperus communis ‘Green Carpet’) that provides a transition from rain garden to lawn beyond. While every rain garden is unique, yours at home—like this one at the Arboretum—will help solve a stormwater runoff problem, benefit the environment, and add to the beauty of the landscape. For more information about gardens at The North Carolina Arboretum, visit http://www.ncarboretum.org/ . 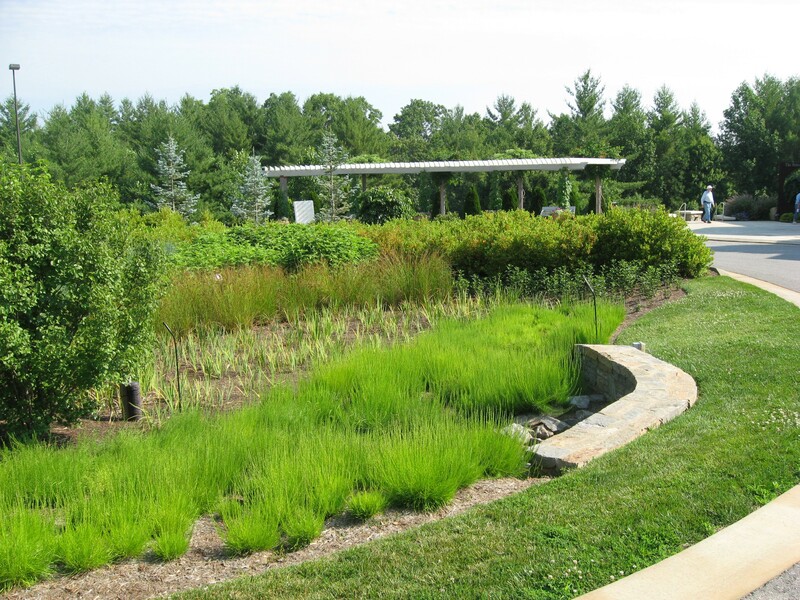 Watch for the final blog in this series: Rain Gardens—Part IV: Regular Maintenance Keeps It Clean and Healthy. Good tree, shrub, and perennial plant list separated by three rain garden zones—wet, middle, and transition. Provides A to Z information with good diagrams. Be sure to adapt plant and soil recommendations to N.C. Mountains. You’ve decided to build a rain garden. Now what? 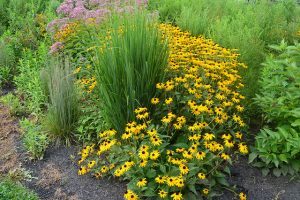 In Part I of our series, you learned what a rain garden is and why they’re beneficial to your residential landscape and the environment. Part II gives you the basics on planning and building your rain garden! Swamp iris, cardinal flower, wild hydrangea, and fern fill this partly shaded rain garden. First, decide where to put your rain garden. Obvious places include low points in your yard where water accumulates when it rains, near downspouts (if extended outward from the house foundation), or where underground drainage pipes daylight. Also consider areas where rainwater flows onto your property from the street or a driveway. It is helpful to put the rain garden in part or full sun for the widest selection of plants and the best drying effects from sun. Mountains present special challenges. When locating a rain garden on slopes, a series of cascading rain gardens can be a viable solution on a hillside. 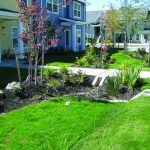 Avoid slopes greater than 12%, which will require different stormwater runoff management methods. Proper construction and plant selection for a rain garden requires knowing your soil and how well the site drains. Is the soil hard clay, sandy, or loamy? Is it highly compacted and impermeable? To find out, conduct a perc test. Dig several one-foot-deep holes in various areas of the proposed garden and fill them with water. Time how long it takes for the water to drain out of the holes. Drain time for a standard rain garden should be 12 to 72 hours. A fast-draining rain garden will empty in 12 hours; any area that takes more than 3 days to drain is a wetland. 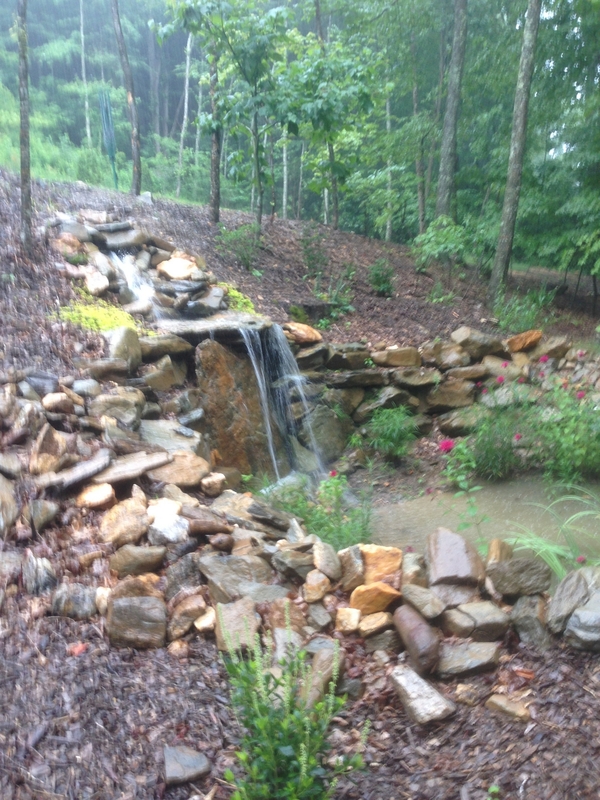 Rain garden at base of slope sized to hold stormwater runoff from hillside, house roof, and steep driveway. The size of your rain garden depends on the impermeable surfaces (roof top, driveway, street) that send water to your garden. The amount of impervious surface determines your rain garden’s width. The depth of your rain garden depends on the results of your perk test—longer drainage times require deeper gardens. In North Carolina, we recommend designing rain gardens to hold a temporary 10-inch deep pond of rainwater, based on a 1-inch rainfall. The size of the rain garden should be about 10% of the area of impervious surface draining into it. First calculate the impervious surface area that will drain to the garden. This will usually be a portion of your roof plus your driveway. If there are other areas draining to the garden, such as sidewalks and patios, you’ll need to add those surface areas as well. Assuming that your house is 60-feet by 60-feet, and that one-fourth of your roof area drains to the garden—this can be determined by the number and location of downspouts—then the impervious surface runoff from the house is 900 square feet (60 ft. X 60 ft. X 25% = 900 sq. ft.). Add together the total impervious surface areas that drain to the garden: 900 sq. ft. from the house roof plus 500 square feet from the driveway for a total of 1400 square feet. Using the rule of thumb cited above, the size of your garden should be about 10% of the total impervious surface areas draining into it. 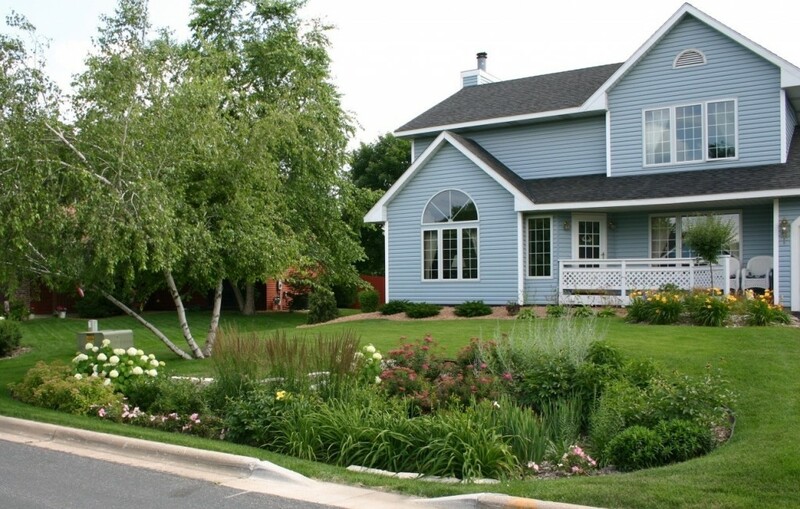 In this example, your rain garden should be about 140 square feet in size (10% of 1400 sq. ft. = 140 sq. ft.). Our example is for sizing a standard-draining rain garden. But what if your soil is hard clay or compacted and does not drain well? Your options include enlarging the square footage area of the garden, digging a deeper basin, and layering several permeable materials—such as filter fabric, perforated pipe, and gravel—beneath the final amended soil layer. 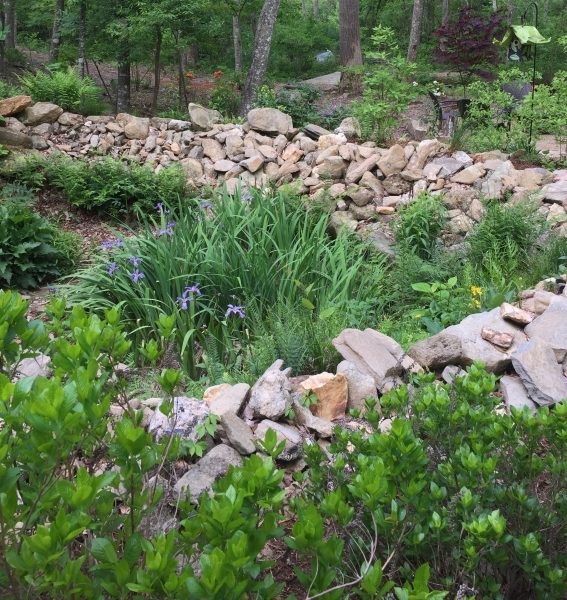 Rain garden with rock-covered berm protects nearby creek from stormwater runoff. Now that you know the size of your garden, you’re ready to lay it out and dig. Use a rope, garden hose, or can of spray paint to outline the boundary. It can be any shape you choose—round, oval, kidney, teardrop—but it should fit the space and complement the surrounding landscape. Be sure to get your underground utilities marked before digging; within North Carolina just dial 811! Digging the basin. Create the basin by digging out the soil to a 13-inch depth—10 inches for rainwater plus an additional 3 inches to accommodate mulch. Turn or till another 6 inches of soil in the bottom of the basin to loosen the dirt and improve water infiltration. What about the rain garden in heavy clay or compacted soil? You may need to excavate the garden as much as 3- to 4-feet deep to accommodate layers of permeable materials. Layering helps prevent standing water in dense and compacted soil. Line the bottom with a permeable landscape fabric, then add layers of gravel, perforated pipe, sand, and soil. Be careful to leave 10 inches of ponding space and 3 inches for mulch in the basin. Creating the berm. Pile all the excavated soil along the sides and lower edge of the garden, creating a berm and keeping the bottom surface area of the basin as level as possible. Make the berm about 3- to 6-inches tall. You can cover it with plants, sod, mulch, or rocks. Making the weir. You’ll need to create a weir or exit ramp for water to overflow the garden in heavy rains. Dig the weir opening on the downhill side of the berm, about one-foot wide and slightly lower than the rest of the berm. You can cover the weir with rock or sod to prevent erosion. Mix a couple inches of topsoil or compost with the loosened soil in the bottom of the basin. Next, you’ll add plants and, finally, 3 inches of hardwood mulch to help maintain soil moisture, prevent erosion, and remove pollutants. Stay tuned for Rain Gardens—Part III: It’s Time to Plant! Provides planning and constructing information and a good plant list. Provides detailed guide and templates for planning and construction a rain garden. Provides detailed worksheet for calculating garden size.